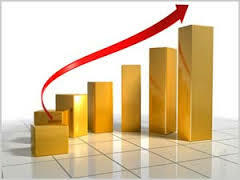 Today the BSE Sensex up by 22 points at 18667. 40 and the NSE nifty up by 7.65 points 5526.75, both market shows volatile movement in current session. Asian market gain by 0.8% to its last trading value. Indian rupee is stuck at 61.25 RS/ dollar .Yesterday market was showed marginally high move but today it shows volatile movement. Precious metal looking on bullish side shows green shade for intraday session , currently gold up 88 RS to 27677 and silver is up by 281 points to 41517 at 10:43 am onwards .